How silly that the first week of November (which some call National Blog Posting Month) 2010, I was so busy and harried and generally off my rocker that I did not manage to blog AT ALL. I missed my very own Bloggiversary, November 2nd! and a few other things that don’t lend themselves to being listed. I’m not telling you this so you’ll be in awe of my abilities. I was not very punctual to many of these things; I didn’t eat too healthfully; I didn’t get whip myself into rock-hard shape like I’d planned; and my treats for school were all store-bought (although I have to say, if you use really cool serving dishes, people are more impressed). And yet, a hectic week like that proves to me that I actually can get more done when I have less free time and more structure. It’s just that certain things fall by the wayside… like my blog. Which won’t do. I think this week will be a lot easier. 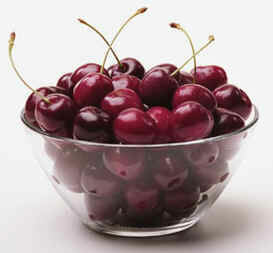 And once the show’s done… life will be a bowl of cherries! I happen to think you’ve done an outstanding job with your blog, and I’m even more impressed by that now that I have read the listing of everything you’re doing! Just taking care of a toddler while working at an outside job is enough already! Go put your feet up and eat some cherries. Happy Bloggiversary! Thanks for the warm wishes! And a thousand thanks for reading. Love your blog — happy bloggiversary! Book club was great… the treats were delish! Oh, well – here I am only READING this post on the 14th! On the train coming home tonight was a mama and baby probably about 9 months. He was pretty good, though he got tired of riding on the train. When he finally drifted off on a pillow on her lap, she whipped out her little scissors and trimmed his fingernails! A universal challenge, it seems, amongst mums of babes.